February | 2011 | Renowrites blog! 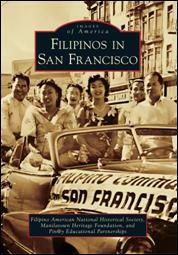 Arcadia Publishing just released “Filipinos in San Francisco,” a book that chronicles the Filipino influence on the city of San Francisco as part of their Images of America Series. This book was written by the Pin@y Educational Partnerships and Manilatown Heritage Foundation, and is mostly a photo journal that traces the history of Filipinos in San Francisco. This release follows on the heels of other West Coast releases “Filipinos in San Diego” (August 2010), “Filipinos in the East Bay” ( Jun 23 2008), “Filipinos in Stockton” (2008), “Filipinos in Hollywood” (Feb 2008), and “Filipinos in Vallejo” (2005). I highly recommend these books for young Filipino Americans ages 10 – 18 years old who are just realizing the Filipino influence in America. I’m so happy Filipinos are being included by Arcadia Publishing as a relevant immigrant community worth investing in. Now if we can get Hollywood to agree? So many Filipino stories that aren’t getting any love…can we have another film we can hang our hats on besides The Debut? Anyway, support the book release and pick up a copy here! The biggest American institution in sports — the Super Bowl. Green Bay 31, Pittsburgh 25. Great game. I personally looked forward to the halftime show knowing The Black Eyed Peas were performing, and I would have to say probably one of the best halftime shows I’ve seen in a long time. Apl.de.Ap of The Black Eyed Peas is of Filipino descent and along with Manny Pacquiao, probably the world’s most successful Filipino in entertainment. Everytime I see him on a national stage, I feel proud and happy he’s doing his thing. I’ve met him a few times during my visits to Hollywood and he’s always been courteous and humble about his success. I hope he and BEP have 20 more years of commercial success. God knows it didn’t come easy for him–he was a poor kid growing up in the Philippines who ended up meeting a kid named William Adams, aka Will.i.Am, in high school when he immigrated to Los Angeles. He recently revealed to People Magazine what a lot of us have known for a long time—he suffers from nystagmus and is legally blind. I remember him touching my face and hand when I first met him and when I found out about his condition, it made sense. Apl.de.Ap is the epitome of someone overcoming adversity physically (eyesight) and economically, and his continued success should make everyone smile. It keeps me focused knowing that if Apl.de.Ap can do it, I can get my book or my music out there and be successful. The Superbowl aftermath also revealed that Will.i.Am couldn’t tweet during the halftime show because there was no AT&T service! Check out this article here and how his star power has forced AT&T to defend themselves. I feel your pain Will. I probably shouldn’t have signed that two year contract back in December now that Verizon carries the iPhone as a device. I’ve been reading some great books lately, which I will post up my reviews shortly. For all my author friends, keep doing what you’re doing! Believe!